Heat shrink tubing (or, commonly, heat shrink) is a mechanically expanded extruded plastic tube ordinarily made of nylon or polyolefin, which shrinks when heated in an effort to return to the relaxed diameter it originally had when extruded. Heat shrink tubing is manufactured in a multitude of varieties and chemical makeups with the exact composition of each type being dependent on the intended application. From near microscopically thin wall tubing to rigid, heavy-wall tubing, each type has precise design and chemical additives that make it suitable for meeting any of a wide variety of environmental demands. 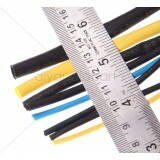 Heat shrink tubing is rated by its expansion ratio, a comparison of the differences in expansion and recovery rate.